If what you seek is a concert experience, one of the most unique concert venues in the U.S. is located in Central Washington. 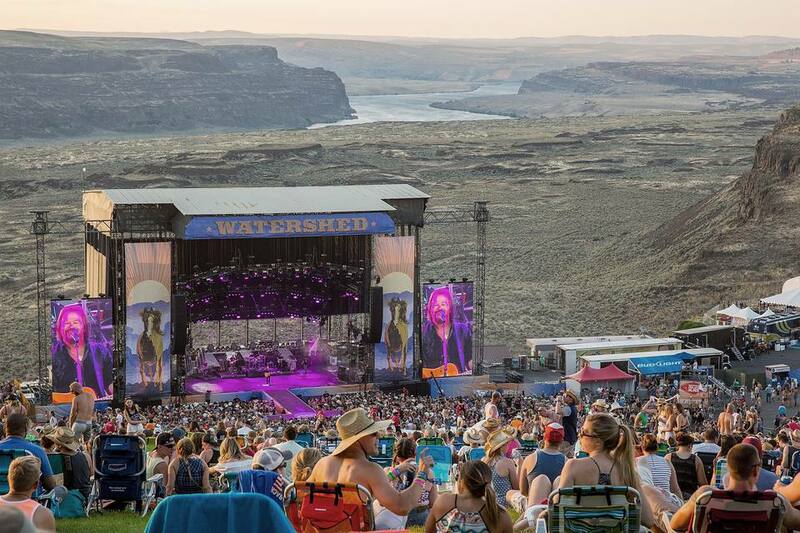 Set into a natural gorge in the Columbia River Valley, just a couple of hours from Seattle is the Gorge Amphitheater. This outdoor arena features a stage, a killer sound system and more than 20,000 seats all overlooking a scenic swath of the Columbia River. The Gorge gets a fair lineup of shows each season, almost all of which make a great reason to camp or stay overnight. Some events, such as the Sasquatch! Music Festival, take place regularly. Sasquatch! is held annually over Memorial Day Weekend. Other annual festivals include the Watershed Festival and Paradiso Festival, but Sasquatch is the biggest and baddest. If you want to experience a summer music festival and don't want to travel far from Seattle, Sasquatch is the festival for you. Other shows routinely come through The Gorge on tours. These include Dave Matthews, Ozzfest, Lilith Fair, Creation Festival, Vans Warped Tour and KUBE 93’s Summer Jam. There are two types of seating at The Gorge—lawn/general admission and reserved. While reserved seating might be the way to go at most venues, arguably at The Gorge, general admission has its perks. Perhaps the most amazing aspect of this amphitheater is the view, which is something that the reserved seating area closer to stage loses its edge on. Seating on the expansive, high-up general admission lawn allows concert-goers to look out over the gorge, while still being able to enjoy the impressive sound quality that this venue offers. Bring along some towels, blankets or cushions to sit on. However, if being up close to the stage is your priority, then reserved seating is best. Bring a jacket. The air gets cool in the evenings and nights even on hot days. The climate in Eastern Washington is arid and dry and there are few clouds in the sky, meaning there's a much larger difference between day and night temperatures than in Western Washington. Be prepared. Especially in the summer, bring a hat, sunscreen and sunglasses. The sun is much more intense and present at The Gorge than in Seattle! If you are sitting in general admission, bring a blanket, towel or cushion to sit on. During some shows, low chairs are permitted, but normal-height chairs are never allowed. Bring food and water as these things will cost you at the small store on the premises. Each person can bring one clear gallon bag of food. Bottled water is allowed in, but soda and alcohol are not. Earplugs if you have sensitive ears or want a good night’s sleep. Many shows do include plenty of people drinking so don't expect pristine quiet at the campground. Depending on the show, small backpacks or coolers are sometimes allowed. Check ahead. Camping is by far the most popular option for people who don’t want to deal with the lengthy ordeal that is leaving The Gorge right after a concert. There are several levels of campsites available. General Camping: Provides the basics, including water, Honey Buckets, showers for a fee and a convenience store. Campsites are relatively small. Premier Camping: These spots have larger campsites, private restrooms and free showers, and can handle larger vehicles and RVs. There's also a shuttle to and from the amphitheater. Terrace Camping: This is a quieter area with free showers and private restrooms, a van to the amphitheater, concierge, free coffee and pastries in the mornings, and easier access to the amphitheater exit. Glamping: Set in the Terrace area, the glamping spots offer a cottage-style tent with basic furnishings inside. There are two levels of parking—regular and Star. Star costs extra and will get you out of the venue a little quicker than those in regular parking. There is no overnight parking in the general lots. If you want to stay overnight, camping is your option. There is no public transportation to The Gorge so driving here is your only option. From Seattle, take I-90 East to exit 143 Silica Road. From areas north of Seattle, you can take US-2 East or I-90. From Tacoma and vicinity, the quickest route involves taking WA-18 East to I-90 and then I-90 East to exit 143. If you want to stay overnight, but roughing it isn’t your thing, there are a few hotels within short driving distance near The Gorge. The town of Quincy has a few basic hotels, such as the Sundowner. If you want to do the weekend right, look to the Cave B Inn & Spa, which also has a winery nearby. Hotels in Ellensburg are also not too far away. Checking online listings for vacation rentals can also be a good alternative. Gorge Amphitheatre tickets are processed through Live Nation.